Did you join us for the largest health fair in the region? Over 450 students, employees and community members took part in Coug Health Fair this year. 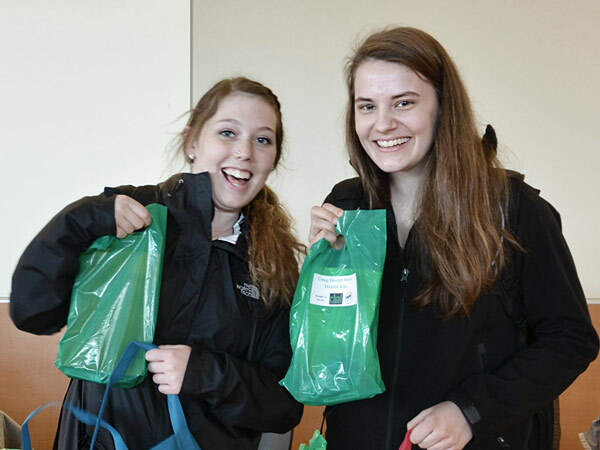 Hosted each year by Health & Wellness Services and the Cougar Health Awareness Team (CHAT), Coug Health Fair offers an opportunity for participants to pick up tips for improving their wellbeing and learn about the health resources available in our community. 62 health-focused organizations and groups from the Pullman-Moscow community joined us for the fair. Exhibitors offered information on services and resources, plus all kinds of giveaways—everything from fresh apples at the WSU Tukey Orchard booth to free chair massages from Gritman Medical Center! 40 participants received health screenings from HWS facilitators. During screenings, facilitators check participants’ cholesterol and blood pressure and teach them how to perform breast and testicular self-exams. Tracking your numbers and performing regular self-exams can be critical for preventing potentially life-threatening diseases, and many students don’t realize how important it is to start these healthy habits now! 30 participants donated blood to the Inland Northwest Blood Center. Each donation of blood can save up to three lives! 6,659 tickets for 30 door prizes were given out to participants who interacted with exhibitors. We selected prizes designed to help support healthy habits, including a Fitbit, a Nutribullet gift package and gift certificates for massage and outdoor recreation trips. If you missed this year’s fair, we still have plenty of opportunities for you to get a health screening and learn about health topics like stress, nutrition, fitness and sleep! Check out CougSync for the full list of workshops offered by Health & Wellness Services and our partners. When thinking about violence happening in the world, or in your own community, have you ever thought, “I’m just one person. What can I possibly do?” At the Violence Prevention Programs office at Health & Wellness Services, we have a simple answer to that question – just do something! Our team believes students are the key to preventing violence on campus. We work with exceptional student leaders who have a passion for making our campus safer. 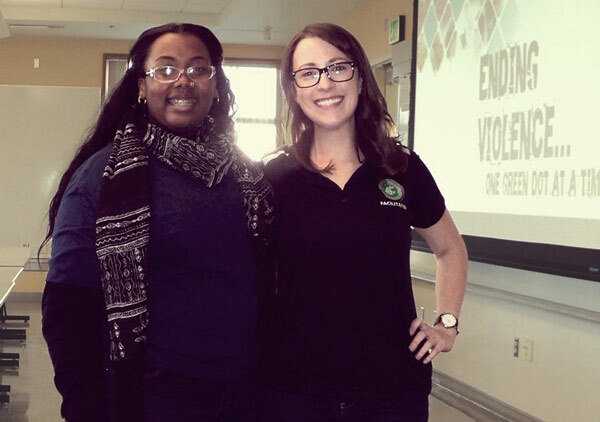 Our graduate assistant Amber Morczek and student employee Janille Lowe recently won Dr. Martin Luther King Jr. Distinguished Service Awards for their community service efforts around campus. Amber, a graduate student in Criminal Justice and Criminology, was recognized for her teaching, research, student activism, and volunteer work. Janille, an undergraduate student double-majoring in Criminal Justice and Criminology and Psychology, was recognized as a member of WSU’s Queer People of Color and Allies, an organization working to create communities of support for queer people of color at our university. In addition to the wonderful work they’re doing around campus, Janille and Amber spend time in our office answering phones, greeting visitors, serving as representatives on university committees and giving presentations in classrooms and to student groups. We’re always looking for more exceptional students to join our team! Volunteers help staff our office, set up for presentations and events, serve on student committees and engage in thoughtful conversations about keeping our campus safe. No experience is necessary to volunteer with our program. We are looking for students who are willing to participate in honest and open conversations about supporting victims and preventing violence. Our volunteers gain leadership and communication skills and make connections with others who share their interests. If you’d like to learn more about volunteering, contact Nikki at nfinnestead@wsu.edu.